Going to yet another holiday party? bringing some goodies along? Running out of ideas? 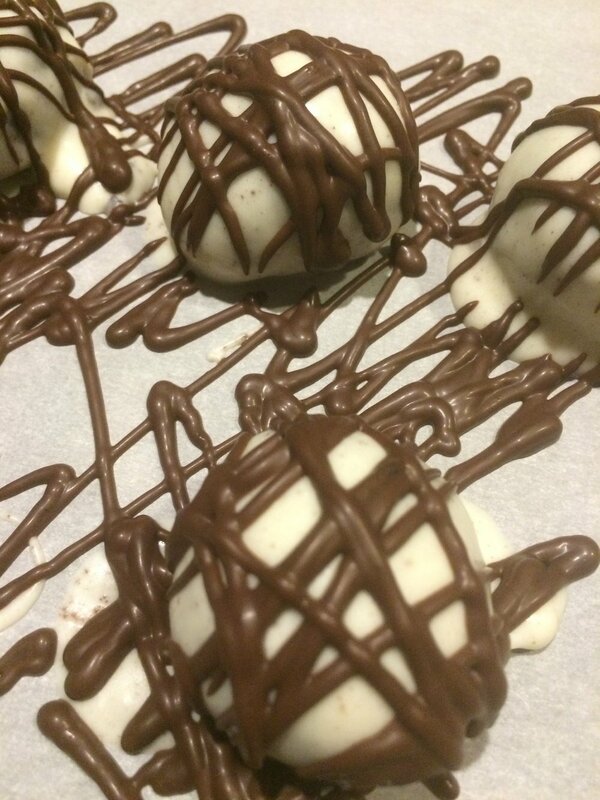 How about quick, pretty and delicious Oreo truffles? They are a jiffy to make with the aid of a food processor, include accessible, inexpensive ingredients and make about 35-40 of these little gems (depending on the size you make them). We were set on flavor and texture enhancers. We first blitzed the Oreos in the food processor until they were a very fine powder, then made sure that our cream cheese was at room temperature and blitzed it again with the Oreo crumbs until it was spreadable consistency. Then came the flavor enhancers: vanilla, cocoa powder and espresso powder (or instant coffee granules). Add to the bowl of the food processor - and you guessed - blitzed again... (If it's too crumbly, you can always add a tablespoon or so of cream). So, what are you waiting for? Get going making these truffles - and try to eat just one... I dare you! 1. Make the batter: Place Oreos in the bowl of a food processor and pulse until cookies transform into fine powder. Drop in cream cheese cut into pieces and process to a fine and smooth paste. Add cocoa, vanilla and espresso powder and pulse again until well combine. If mixture is too crumbly add some whipping cream, one tablespoon at a time. 2. Form the truffles: Using a cookie scoop, portion out the batter and then roll into small balls. (i used a 1” cookie scoop). Place balls on a tray topped with wax paper, cover truffles with plastic wrap and refrigerate for 1 hour or up to overnight. 3. Coating: Place 2 cups of Ghiradeli melting wafers of your choice in a microwave safe bowl and melt on medium-low heat. (I used both dark chocolate and white chocolate for contrast). 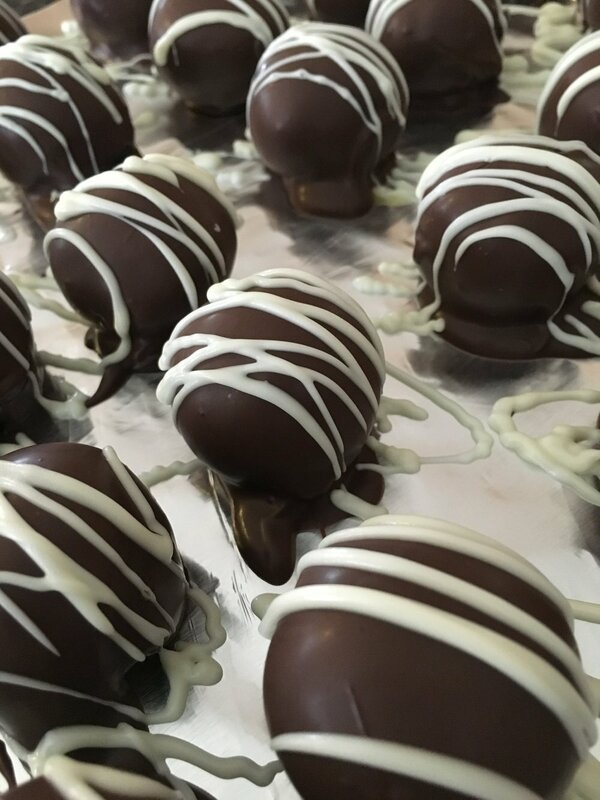 Gently place one truffle at a time in the melted chocolate and roll it around to coat. Lightly slide a fork under the truffle and lift out of the chocolate, letting the excess chocolate drip back into the bowl. Place the coated truffle on a clean wax paper or a sheet of tin foil to set. repeat with rest of truffles. 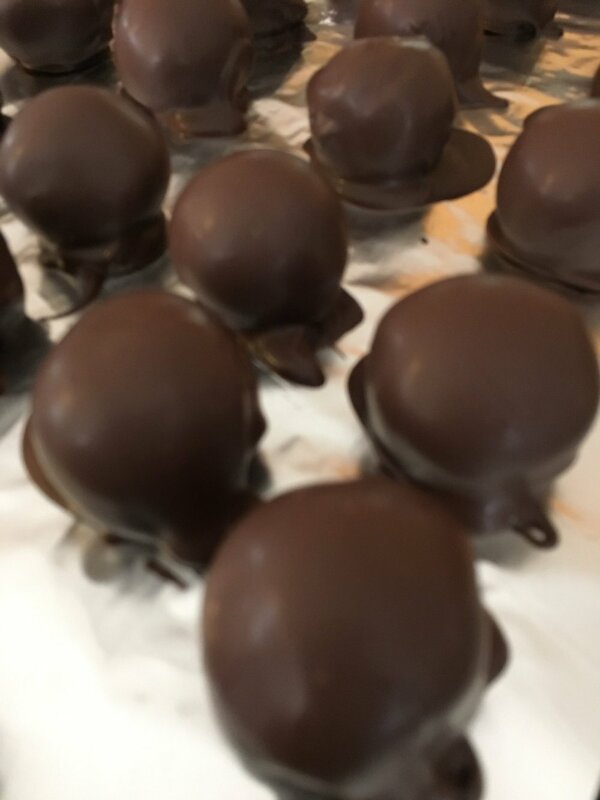 Once the chocolate is set, melt 1 cup of contrasting chocolate color in a similar way, place in a piping bag and drizzle narrow lines of contrasting color on the set truffles. 4. Storage: Once the chocolate has dried, place the truffles in a single layer in an airtight container. Truffles will last 3 days on the counter and about 1 wee in the fridge. So... Do you really think they'll last that long?? ?